This page contains a Walkthrough for the Melemele Island Kahuna Grand Trial, including objectives, obtainable items and wild Pokemon encountered. Head for Route 3 to reach the next destination – Melemele Meadow. When you arrive at Melemele Meadow, there will be a cutscene with Lillie. Proceed to the Seaward Cave. You will encounter the Ultra Recon Squad Dulse (Sun) or Ultra Recon Squad Soliera (Moon) when you arrive at the Seaward Cave. He/She uses a Lv.13 Furfrou in battle. After the battle, there will be a cutscene with Lillie again. You will then be challenged by Hau to a battle. Hau’s starter Pokemon will be at level 13, as well as a Lv.12 Pikachu and a Lv.11 Noibat. Use Ground-type moves against Pikachu and Electric-type ones on Noibat to defeat them easily. After defeating Hau, proceed to Route 1 to reach Iki Town. 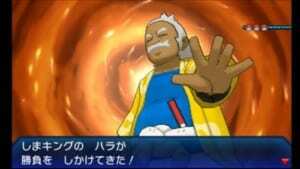 When you arrive at Iki Town, talk to Professor Kukui about the Grand Trial with Melemele Island Kahuna Hala. Challenge Island Kahuna Hala at the back of the city. Hala uses a Lv.15 Machop, Lv.15 Makuhita and a Lv.16 Crabrawler. Since Hala uses Fighting Pokemon, it’s best to use Flying- or Psychic-type Pokemon against him. If you chose Popplio, using Disarming Voice will also be effective against Hala’s team. After defeating Hala, you will get the Fightinium Z-Crystal and the Tauros Ride Pager. You will get a tutorial on using the Poke Ride, as well as the TM54 (False Swipe). Afterwards, head to Hau’oli City.